The Hydrostar Onion Tank is an industrial-strength storage option that provides fast open top storage of liquids including process water, waste water and production fluids. Perfect for any job site or facility that requires bulk liquid storage, these tanks are an economical alternative to standard storage options. All onion water tanks are designed to be completely collapsible and self-rising for fast transportation to and from a storage area. With fast set up and easy filling on site, these tanks are an economical way to temporarily store water. The frameless onion water tank is a completely flexible and self-supporting structure. When compared to other storage options, these tanks faster to set up and easier to maintain during storage. Their easy yet reliable design has made them a favorite for first response, emergency response, decontamination or temporary bulk liquid storage. 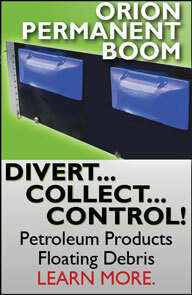 When not in use, all tanks will collapse down for compact storage and quick transportation. The onion tank is one of many flexible storage and containment options available for industrial or commercial applications. Due to the flexible layout of the tanks, these units are often built with fabrics that equipped to meet the specific demands and storage requirements of your location. To help extend the lifespan of your tank, many customers also choose to use additional items such as a ground cloth or top cover to help protect your tank and stored liquids. Items like the ground cloth are designed to offer a reliable liner to line your location and protect the bottom of your tank from abrasions. Similarly, top covers are used to cover the contents of your tank and prevent wind, rain, and sediment from mixing into your tank. Fittings may also be added to the tank to help quickly drain your materials. For our complete liquid storage variety, please check out our Onion Tank, Frame Tank & Flexible Tank Variety.